Pay for Driving Lessons - Why? Why pay for driving lessons? Taking driving lessons with a relative or friend is surely a more cost-effective way to learn to drive. But it's not a particularly safe, or enjoyable, way to learn. In 2008 , there were 2.688 million vehicles on Scotland's roads, and there were 15,576 casualties due to road traffic accidents. 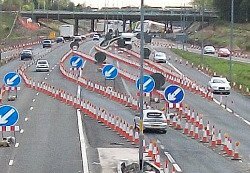 Learning to drive on today's roads, with the level of traffic we have and, what seems like, continuous roadworks and contraflows, can be very stressful for learner drivers. It's really busy in our built-up areas: traffic coming from all directions and everyone in a rush to get where they want to be. Though it's great to have the independence and convenience that a driving licence brings, it's often intimidating to learn. Learning to drive can be a positive experience, that's both safe and enjoyable. (See our driving lessons page to judge for yourself). Being taught to drive by a relative, or friend, can increase the stress level of both the learner and the teacher, taking away the fun of learning to drive and making it a chore for both parties that can be unsafe. But, it is cheaper. To pay for driving lessons with a driving instructor isn't cheap , but there are so many benefits that, for many people, the cost is worth it . The Benefits of Learning to Drive with a Driving School. The car that is used for teaching learner drivers is dual-controlled, which allows the instructor to independently stop the vehicle, if necessary, making all driving situations safe and controlled. This reduces the stress on both parties, allowing both the learner and instructor to relax and focus on learning. The learner vehicle has a very visual roof sign and prominent external livery that indicates to other road-users that the driver is under instruction and in the process of learning to drive. This encourages other road-users to be more tolerant and understanding, and to give the learner extra time and space, ensuring a safer and less pressured learning experience for the learner. The learner vehicle is a safe , 5* NCAP safety rated vehicle, which ensures an extremely high level of protection for the learner, the instructor and pedestrians if there was an accident. Each course of driving lessons is structured to the needs of the individual learner and covers all aspects of driving that he/she will need to show competent driving skills when taking their driving test. An assessment session is always a major part of the first lesson, to identify existing skill level and avoid un-necessary tuition. Lessons cost, and we want to ensure that our clients only pay for driving lessons that they NEED. Our lessons cover all the driving manoeuvres that are stipulated by the government to be part of the practical test. Through regular practice in their driving lessons, our learners become skilled in all the manoeuvres. Our driving courses focus on learning to drive defensively, where awareness, anticipation and structured reaction means safety. Teaching a defensive driving approach to learners is of paramount importance to us. We simulate mock driving tests to help prepare our learners, as best we can, for the real thing and to make them aware of what the driving test is like. We stress, during our teaching, that our learners are not just learning how to pass the driving test. They pay for driving lessons to learn to drive. We encourage them to think about their own safety and the safety of others, at all times. We actively discuss with our learners their responsibility to passengers, the need to have consideration for other road users and pedestrians and that their own safety is predominantly in their own hands when they are driving. We want to reduce the number of casualties on Scotland's roads, so we endeavour to train drivers who, when they get their licence, will be safe, skilled and conscientious. For many people all the above benefits mean 'safety', as well as 'value for money', making it worthwhile to pay for driving lessons. Scotland's roads are getting so busy that it's much safer to be a properly trained driver when you're out there. It seems so obvious that we would never expect a doctor to practice medicine without the proper training, because they have a responsibility to us, their patients. And a good employer puts proper training in place when their employees have to operate machinery as part of their job, because they have a responsibility to ensure the safety of their employees. We, as individuals, have a responsibility to ensure the safety of ourselves, our passengers and the general public when we drive a machine the size of a car. In the best interests of everyone, maybe the most responsible way to learn to drive is to pay for driving lessons and get proper training. Learning to drive with a school of motoring has all of the above benefits. For many people, these benefits balance the cost in money. Antonine Driving School focus on teaching learners to drive safely and skillfully. Take a look at how we structure our lessons , have a look at the content, and judge for yourself whether we deliver value for money. We're confident you'll agree that we do. And that's what makes it worthwhile to pay for driving lessons. If you have any queries, please contact us . We'll be happy to answer any questions.